﻿ Discuss these questions with your partner. Методические указания рассмотрены и одобрены кафедрой, протокол № 8 от 21 апреля 2009года. Целью методических указаний является развитие навыков говорения по теме «Моя будущая специальность». Методические указания построены на аутентичных англоязычных научно-популярных текстах. Предтекстовые упражнения знакомят студентов с новыми словами и терминами, встречающимися в текстах, активизируют знакомую студентам лексику, готовят к обсуждению проблем, изложенных в текстах. Послетекстовые упражнения направлены на контроль понимания содержания текстов, закрепления новых лексических единиц, грамматических конструкций. В методических указаниях представлены упражнения, развивающие навыки письменной речи, а также упражнения, стимулирующие высказывания студентами собственного мнения и его аргументацию. В результате изучения данных методических указаний студенты должны пополнить свой лексический запас за счёт новых слов и терминов, связанных с их будущей специальностью, научиться обсуждать специфику профессиональных вопросов. 1. What can you see around you that is living? 2. What can you see that is not living? 3. What can living things do that non-living things can't? 4. Can you classify living things? Match these words with their definitions. Read the text about the development of biological sciences and find out what facts you aren’t aware of. Biology means the study of lifeand it is the science which investigates all living things. For as long as people have looked at the world around them, people have studied biology. Even in the days before recorded history, people knew and passed on information about plants and animals. Prehistoric people survived by learning which plants were good to eat and which could be used for medicine. Farming would not have developed if they had not begun to understand which animals could produce food like milk and eggs. In the past, more than 2000 years ago, people in the Middle East understood the part that insects and pollen played in the life cycle of plants. The ancient Egyptians studied the life cycle of insects and were particularly interested in the changes they went through as they grew from larvae to adult insects. The ancient Mesopotamians even kept animals in what were the earliest zoological gardens. The ancient Greeks, too, were greatly interested in understanding the world around them. Aristotle recorded his observations of plants and animals, and his successor, Theophrastus, wrote the first books on plant life, which made a very important contribution to the study of botany. After the fall of the Roman Empire, the centre of the scientific world moved to the Middle East. The Arab scholar Al-Jahiz wrote the Book of Animalsin the 9 th century. He was just one of a great number of Arabic, Persian and Turkish scientists who set out the foundations for the modern science of biology. Later still, in Europe, particularly in Germany, scholars such as Albertus Magnus discussed the properties of life. Magnus wrote seven books on plants and twenty-six on animals. Modern biology really began in the 17th century. At that time, Anton van Leeuwenhoek, in Holland, invented the microscope and William Harvey, in England, described the circulation of blood. The microscope allowed scientists to discover bacteria, leading to an understanding of the causes of disease, while new knowledge about now the human body works allowed others to find more effective ways of treating illnesses. All this new knowledge needed to be put into order and in the 18th century the Swedish scientist Carl Linnaeus classified all living things into the biological families we know and use today. In the middle of the 19th century, unnoticed by anyone else, the Austrian monk Gregor Mendel, created his Laws of Inheritance, beginning the study of genetics that is such an important part of biology today. At the same time, while travelling around the world, Charles Darwin was formulating the central principle of modern biology - natural selection as the basis of evolution. It is hard to believe, but the nature of viruses has become apparent only within the last half of the 20th century and the first step on this path of discovery was taken by the Russian botanist Dmitry Ivanovsky in 1892. In the 20th century, biologists began to recognise how plants and animals live and pass on their genetically coded information to the next generation. Since then, partly because of developments in computer technology, there have been great advances in the field of biology; it is an area of ever-growing knowledge. Decide if the following statements are true or false. 1. The earliest people must have known about plants or they would have died. 2. The Egyptians were interested in changing the way insects lived. 3. Europeans learnt all they knew about biology from the Middle East. 4. The microscope allowed biologists to treat illnesses. 5. Darwin's theory was one of the most important in biology. 6. The study of biology hasn't changed at all over the centuries. 1. Do you know what a germ is? 2. What can you say about their size and shape? 3. What do you know about the classification of germs? Listen to the lesson about germs. Circle the correct word or phrase to make true statements. 1. The teacher believes people rightly / mistakenly / rarelythink all germs are bad. 2. Germs don't live on microbes / animals / people. 3. Some/ all/ fewgerms are responsible for illnesses. 4. There are four basic types of fungi / protozoa / germ. 5. Germs are only round / mostly long and thin / different shapes. 6. Discuss these questions with your partner. 7. What careers in biology can you think of? 8. Do you like any ofthem? Which ones and why? 9. Are there any areas of biology that you do not find interesting? 10. What areas of biology do you consider the most important for human society nowadays? Why? Complete the sentences below with words from the box. Unfortunately, the growth of cities often means wildlife is….. with extinction. A..................... is an animal that feeds its babies milk. Farmers that grow……. like cereals and vegetables normally have to work very hard. It's amazing how animals can.. to changes in their living conditions. There are many different ……..of butterfly. There are a vast number of living things in the world. These comprise animals, plants and microorganisms. Living things are often described as organisms. Living things are found everywhere in the world — on land, in the air, in the sea and underground. Different organisms live in different places. The place where an organism lives is called its habitat.The habitat of a fly might be a greenhouse, a goldfish's habitat might be its tank or bowl. The Earth provides millions of different habitats — some hot, some cold, some dry, some wet. The conditions in a habitat make up the environment. In general, living things prefer a moderate environment with warm temperatures, water and a supply of food. The differences in physical factors, such as temperature, humidity and daylight hours, between localities are often reflected in the organisms found there. For example, animals which live in water often have streamlined bodies and those that live in very cold climates often have thick fur or layers of fat. We can sum this up by saying that many organisms are adaptedto the habitat in which they live. 1. How are habitats varied? 2. What makes up the environment? 3. What does it mean – to be adapted to the environment? 4. Why are chemical reactions essential for life? 5. What are materials in an organism's body replaced by? 6. Where do living things get energy from? 7. Why mustn’t waste products of metabolism be allowed to collect in an organism? 8. What is the difference between sexual and asexual reproduction? 9. How do plants move? 10. What stimuli do living things respond to? In an ecosystem, feeding patterns are not usually simple. For example, mice will eat fruit and small insects as well as grass seed. The owl will also eat other prey. In any community of plants and animals, complex patterns will emerge. Many food chains will exist and some of these will be interlinked. 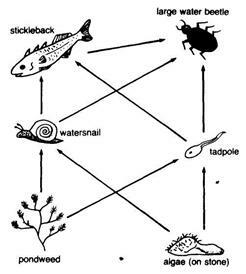 These interlinked food chains are described as a food web.A food web for a simple pond community is shown in Fig. 3. Politicians around the world are meeting to discuss ways in which to safeguard our environment. The message is clear. Leaders in industry must find alternatives to create energy, other than traditional burning of 1…..such as coal. The laws governing the disposal of 2….. must be rigorously enforced. Governments must support projects to reduce our dependency on oil, and 3….. must decrease – our rainforests must be protected, not destroyed. Many farming methods are also detrimental to our environment. Firstly, there is the 4….. of pesticides on local 5….. .If insects are killed to boost crop production, other creatures in the food chain risk elimination too. Secondly, these chemicals pollute the produce and the soil that crops grow in. If more farmers could be persuaded to use less intensive methods, 6….. farming methods for example, and consumers be persuaded to pay higher prices to support this move, agricultural dependency on poisonous chemicals would decrease dramatically. As individuals, we can all help in a very particular way by 7….. materials such as glass, cans and paper. Collection bins such as 8….. and waste paper containers are becoming a more common sight, making it easier and more convenient to sort recyclable household waste for reprocessing. Reducing our dependency on natural resources, and on petrol in particular, is vital. The increasing volume of traffic on our roads is one of the main contributors to the 9….. which is causing our planet to get warmer. We must all take responsibility for the alarming 10….. that this is having on the environment we live in. Pasteur (1822-1895) began his scientific career as a chemist, but it is because of his applications of germ theory to the prevention of disease that he became known as 'The Father of Microbiology'. Pasteur did not create germ theory, but he proved it to be correct. Once he had achieved this, he set about finding ways to prevent germs, the microorganisms present in the air, from infecting food and people. He completed his famous experiment proving that microorganisms were present in the air while working for a wine company. He was trying to discover why wine sometimes went bad as it was being made. Once he had found the cause -microorganisms - he began to develop the process which carries his name - pasteurisation. It was perfectly possible to kill all the microorganisms in food by boiling it, a process known as sterilisation, but this damaged the taste and the quality of the food. Pasteur's process killed not all, but most, of the microorganisms, with the result that the food needed to be kept cool and eaten or drunk within a limited time. Most importantly, the quality of the food was not harmed by the process. Much of the food we eat today is pasteurised. His next achievement was to build on the discovery of the British scientist Edward Jenner. Many years earlier, Jenner had discovered a way of giving people resistance to the deadly disease smallpox, by injecting them with a similar disease that was found among cows. The process became known as vaccination. Pasteur applied germ theory to his work and looked at samples of blood taken from healthy and infected animals. He grew bacteria in his laboratory and used it to infect animals. By chance, some of these germs failed to grow well in his laboratory; these weak germs were then used to infect some chickens. Although the chickens suffered at first, they made a complete recovery and could not be infected again. In this way, he discovered a way of increasing resistance to disease. Pasteur developed vaccines for many serious diseases including cholera and anthrax. At that time, these illnesses were certain death for anyone who caught them. Pasteur's discoveries revolutionised work on infectious diseases. Pasteur's vaccines were different from Jenner's in one important way. Jenner found a weak form of smallpox and transferred it to humans. Pasteur weakened the disease in a laboratory and immunised people with that weakened form. His success allowed a colleague to develop the first vaccine for rabies, which Pasteur used to save the life of a nine-year-old boy. By this act, Pasteur's position as a hero was assured. Thanks to the work of Pasteur, we now live longer, our food stays fresh longer and we are less likely to die of disease. Indeed, smallpox is no longer found anywhere in the world, due to a huge vaccination programme carried out in the 20th century. This could never have happened without the scientific achievements of The Father of Microbiology. 1. Gregor Mendel was born on 20th July, 1822, and died on 6th January, 1884. He was a biologist and botanist whose scientific research showed that inheritance proceeds according to certain scientific laws. 2. Mendel was a brilliant student and his family encouraged himto study, but they were very poor so Mendel entered a monastery in 1843. There he taught Mathematics, Physics and Greek to high school students. Eight years later, in 1851, the monastery sent him to the University of Vienna where he was able to continue his education. In 1853, he returned to the monastery and began teaching and researching again. 3. Mendel's theories of heredity based on his work with pea plants are well known to students of Biology. But his findings were so different from the accepted views on heredity at the time that his work was ignored until long after his death. His paper, Experiments in Plant Hybridisation, in which he described how traits were inherited, has become one of the most influential publications in the history of science. 4. Mendel was the first person to trace the characteristics of successive generations of an organism. In Mendel's day, a number of hypotheses had been suggested to explain heredity. The most popular one was the so-called blending theory. According to this theory, inherited traits blended from generation to generation. For instance, a red rose crossed with a white rose would, over time, produce a pink rose. Another theory put forward by Charles Darwin was called pangenesis. This stated that there were hereditary particles in our bodies, and that these partieles were affected by our actions. The altered partieles could be inherited by the next generation. These theories were disproved by Mendel. 5. The first thing he noticed when he began his experiments was that traits were inherited in research is being used to improve the way we live certain numerical ratios. This observation led him to come up with the idea of the dominance of genes and he tested itin peas. For seven years he crossed thousands of plants to prove the Laws of Inheritance. From his experiments, Mendel developed the basic laws of heredity. Those laws are the following: that traits do not combine, but are passed whole from generation to generation (which disproved the blending theory and Darwin's theory); each member of the parental generation passes on only half of its hereditary information to each offspring (with certain traits dominant over others); and different offspring of the same parents receive different sets of hereditary information. 6. Mendel's research formed the beginnings of the modern science of genetics. Genetic theory has had a huge impact on our lives. Many diseases, for example haemophilia, are known to be inherited, and family histories can be traced to determine the probability of passing on a hereditary disease. Scientists can now design plants that are easier to grow, or which can produce more food. This practical side of the results of Mendel's research is being used to improve the way we live. Decide which answer (А, В, С or D) best fits each space. ……..(9) can be difficult to find. In that case, why not take a ……..(10) one? You will gain some useful …….(11). Remember that even if you have the right ……..(12), you may have to ……. (13) lots of application forms before you are asked to ……..(14) an interview. But don't worry if you don't know what you want to ……. (15) exactly. You'll enjoy finding out! Adrian has finished school and is looking for work. He has decided to apply for a job helping on the Antarctic Research Project. Many people have unsuccessful interviews because they aren't fully prepared. This may be because they haven't done their research properly and can't answer questions about the company they are hoping to join. Or it may be because they are nervous and don't perform well. Going for a job interview is never easy whether it's for a full-time career, or a part-time job during the holidays. However, it is possible to learn how to do well in an interview simply by following a few basic rules. Firstly, find out as much as you can about the company or the organisation. Write notes about the job you are trying to get and make a list of questions you can ask. Then make sure you know exactly when and where the interview is. Look up the location on a map. Find out about bus and train timetables if necessary and try to predict exactly how long the journey will take. If you are really worried, make the journey a few days before your interview so you can find out. Another important rule is to plan what you are going to wear well in advance. Make sure it's clean, it fits and it's comfortable! Clean your shoes and sort out what you are taking in your bag or briefcase. All you should do the night before is have a quick look at your notes. Go to bed early so you can get up in good time and calmly get yourself ready. When you walk into the interview room look directly at your interviewers and shake their hands. Finally, be calm and relaxed, and speak clearly. Work in groups of three or four. You have applied for a job as a representative for a premium Spanish olive oil company, selling the product to restaurants and hotels in your country. The company has asked you to come for an interview. For each question in the interview, there are three possible answers. In your group, discuss which answer you think is the best and circle the letter A, B, or C. When you have discussed all the questions, calculate your score. 1. Good morning. Could I start by asking a few questions about your experience in the sector? A Of course. What would you like to know? В Well, I've been working in the food sector for the last ten years. С What sector do you mean exactly? 2. And I imagine you have dealt with a lot of different clients in your work. Is that the case? A Yes, a lot of clients. What kind of clients does your company deal with? В Yes, all kinds, really. С Yes, quite a wide variety, although most were large hotels and restaurants. 3. I see. And what kind of products have you worked with? A Mostly with specialist sauces. В I've worked mostly with specialist sauces. Does your company make them? С I've worked mostly with specialist sauces, such as aioli, tartar sauce, etc. 4. So what kind of difficulties do you think we might have selling our product? A Well, it depends on your quality and price compared with the competition. В The main difficulty could be in convincing clients to buy a higher priced, premium product. С It's difficult for me to answer that because I don't know your clients or product very well. 5. So what do you think you would do to convince them to buy our product? A I would perhaps focus on the higher quality compared to the competition. В I'm sure you know the answer to that much better than I do. С Maybe give them a discount? 6. And why do you think you would be good at this job? A Because I know how to handle clients and analyse the competition. В Because I have experience in sales and food products. С Because I have worked in the food sector for ten years. 7. Finally, do you have any questions? A Not really, I think we've covered everything. В Is there the possibility of a company car? С Is the company planning to launch any new products in the near future? Congratulations, your interview was a success! The company felt that you were interested, had the right experience and skills, and had prepared for the interview well. Best of luck with your new job! Sorry, the company thought that you didn't have the right skills to be a representative. Remember to find out as much as you can about the company, and then tell them about your relevant skills for the job. Better luck next time! Sorry, the company has decided that you didn't seem interested in the job. Remember that stock responses are usually not enough to impress a potential employer. Look at your answers again and see if you can improve your score. Better luck next time! 2. Hill, G. Science single and double Award / G. Hill. - London: Letts Educational Ltd, 2000. – 370 p.
3. Kelly, K. Macmillan Vocabulary Practice Series with key / K. Kelly. - Oxford : Macmillan Publishers Limited, 2008. – 255 p.
4. Kozharskaya, E. Macmillan Guide to Science. Student’s Book / E. Kozharskaya. - Oxford : Macmillan Publishers Limited, 2008. – 127 p.
5. Vince, M. Macmillan English Grammar in Context. Intermediate with key / M. Vince. - Oxford : Macmillan Publishers Limited, 2007. – 232 p.
Exercise 27, p.38: Ask questions indicated in the brackets. I. Find in the lesson the equivalents of the following expressions. Why are these things important in negotiating? II.Work in groups. Choose one of these companies.